Are you looking to earn passive income online? Do you want to work part-time online & pay your mobile & other utility bills? If your answer is yes, this will change your life from here! What is Google AdSense & how it can make money for you? Google AdSense is a free service offered by Google for publishers to monetize their web content. A publisher can be anyone with a blog, Website, Youtube channel or other allowed online property. AdSense has always been most popular ways to monetize the content & stepping stone for people who want to earn online. 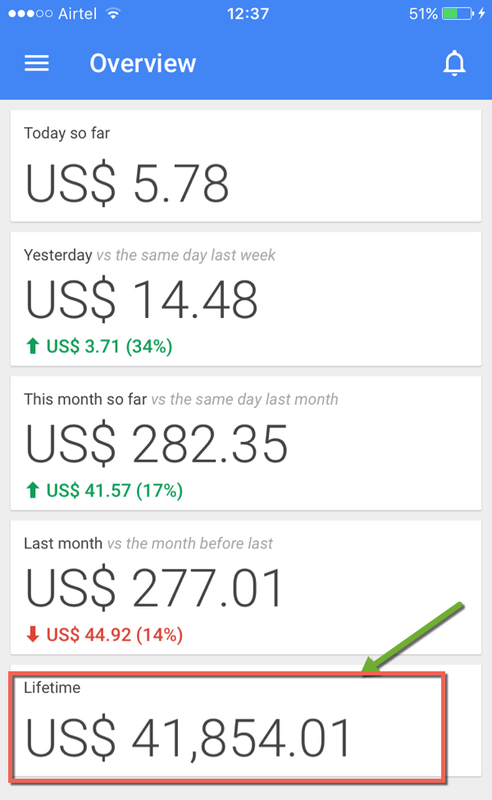 The reason for AdSense popularity is because of ease of using it & after initial configuration, all you need to do is sit back & see money coming into your account. Moreover, they pay in time & you don’t have to worry about being scammed online. Getting started with AdSense is easy & you need a blog or Youtube channel to get approval for AdSense account. Once you have an account, all you need to do is create ads (Easy process) & place the AdSense code on your blog using free plugins, & AdSense will automatically display ads. Now, When a reader clicks on those ads, you will earn money from it. After this, your goal is to get traffic to your blog & more traffic you get, more income you will generate. If you are thinking this is so easy & you can ask your friends or family to click on the ads, kindly don’t. Google AdSense is a quality ad network that is free to join but they have maintained a high level of quality & any such activities where a publisher is asking to click on ads or using illegal methods to get more clicks,will cost you a disabled AdSense account. Once your account is disabled, it would be hard for you to get back an account. I have given links to the best AdSense resources below which would help in setting & maintaining your AdSense account, but first let’s help you in getting a web property that is a requisite before you apply for AdSense account. To apply for an AdSense account, you need to have a web-property. That could be a blog, website or anything that is allowed by Google. Here I’m listing down three places where you can create a web property in next few minutes to get started. Depending upon your level of understanding, you can start for free or put a little money if you already aware of how things work online. Domain name: BlogSpot offers a domain name such as selectedname.blogspot.com. It’s advisable to use a name that is easy to remember, type & pronounce. Read: How to decide name of your blog. Niche: Start posting articles in one particular topic. Be it finance, technology, fashion food or anything. Ensure every post you write should have more than 400+ words with images. Writing an article on BlogSpot or all other modern platform is quite easy. Here is how you select the niche of your blog. Design: When you are setting up your first blog on BlogSpot, you will be using any of the template offered by them. They are good, but you can always use a 3rd party free template to make your BlogSpot blog look more professional. Here is a resource for premium looking free BlogSpot template that you can use on your blog. Pages: Posts are for writing articles & pages are for important pages like about, contact & so on. Ensure you create & add About/Contact page from day one. Your about page will have a great impact on your blog visibility & here you can learn why it’s so crucial to have an about page. Here is a guide to help you create a free blog on BlogSpot. There is also a video embedded in the post which would make the learning easy for you. This one I recommend to those who have a prior experience of working online or have an idea of how things work. More than 22% of the websites in the world is powered by WordPress & is seen as most respected blogging platform of all time. The idea of having your hosting & domain name is exciting & seems challenging at first, but WordPress makes it easier for anyone with no experience to gets started with their blog online. Hi i would like to know what i have to do to get started ? ?